Neville Brody (born 23 April 1957 in London) is an English graphic designer, typographer and art director. Influenced by Punk, Dada and Pop Art. He is the Head of the Communication Art & Design department at the Royal College of Art. In 1988 Thames & Hudson published the first of two volumes about his work, which became the world’s best selling graphic design book. Combined sales now exceed 120,000. An accompanying exhibition of his work at the Victoria and Albert Museum attracted over 40,000 visitors before touring Europe and Japan. partly responsible for instigating the FUSE project – the conference and quarterly forum for experimental typography and communications presenting an influential fusion between a magazine, graphics design and typeface design. Each pack includes a publication with articles relating to typography and surrounding subjects, four brand new fonts that are unique and revolutionary in some shape or form and four posters designed by the type designer usually using little more than their included font. The publication is approaching its 20th issue over a publishing period of over ten years. Three FUSE conferences have so far been held, in London, San Francisco and Berlin. The conferences bring together speakers from design, architecture, sound, film and interactive design and web. designing record covers for artists such as Cabaret Voltaire and Depeche Mode. created the company Research Studios in 1994 produces and publishes experimental multi-media works by young artists. The company also completed a visual identity project for the famous Paris contemporary art exhibition Nuit Blanche in 2006. 2007 launched a new look for the champagne brand Dom Pérignon in February 2007, having been appointed in 2004 to help the brand with its strategy and repositioning. 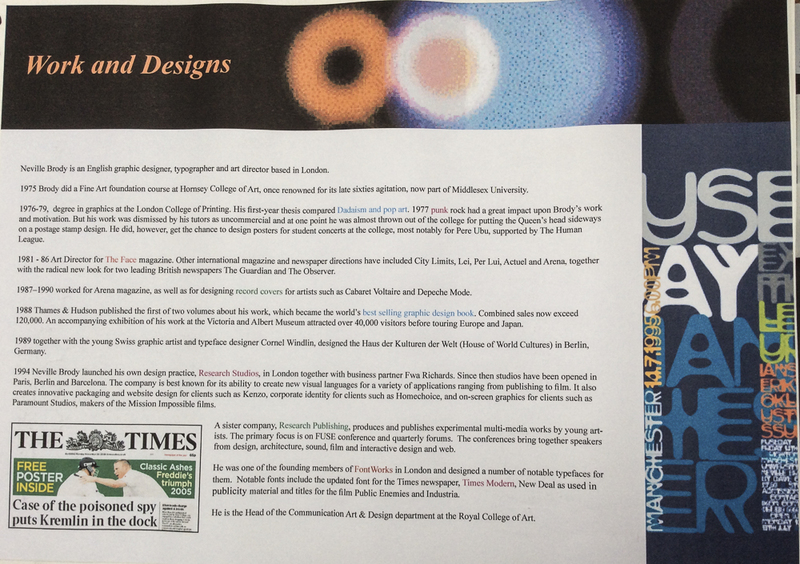 2006 the updated font for the Times newspaper, Times Modern – the first new font at the newspaper since it introduced Times New Roman in 1932. The typeface shares many visual similarities with Mercury designed by Jonathan Hoefler. 1990 he also founded the FontFont typeface library together with Erik Spiekermann.